Indeed, the world cup has been the culprit for my absence. Colombia has been overwhelmed by football in recent months. My first post upon returning is actually going to be my first guest writer’s! Gloria is a landscape architect who currently works in New York. She is one of the few foreigners who spells ‘Colombia’ correctly. October last year, I happily joined Jessica as AnotherChineseInColombia for 6 days. Growing up in Hong Kong and later in the United States, my knowledge of Colombia was slim. The impressions I had were based on Gabriel Garcia Márquez, news regarding the drug war and FARC, and as a football fan, Andrés Escobar and the 1994 World Cup. Later, through my studies in town planning and landscape architecture, I was often academically exposed to the city of Medellín and its transformation. The city is lauded as an example of how civic-minded design could transform a struggling city. Social urbanism believes in the transformative power of design, that high quality urban system and spaces can give pride back to torn communities so the residents would take charge of the surroundings and improvement of their lives. 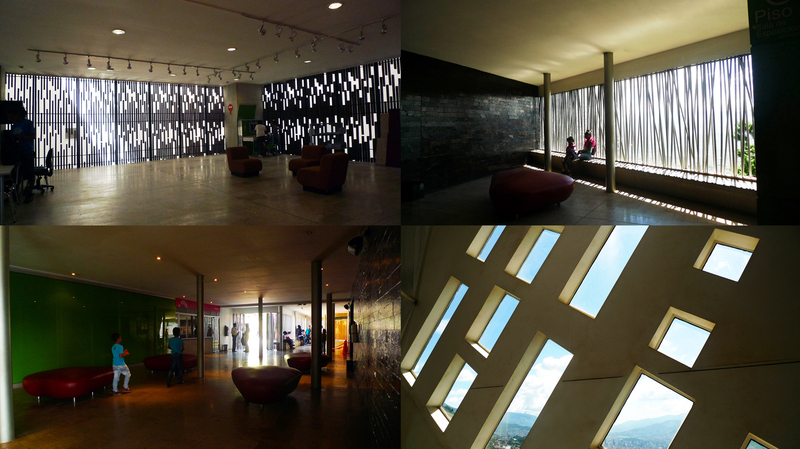 One of Medellín most famous transformation projects is the library parks development. The city is situated in a valley, bisected by the Medellín River, and surrounded by hills. Residents who cannot afford formal housing in the city centre settle in informal neighbourhoods on the hillsides. These informal settlements have grown with poverty and crime. When Sergio Fajardo was elected as Medellín’s mayor in 2004, he implemented a project that built libraries and parks in five informal neighbourhoods (Santo Domingo, La Ladera, La Quintana, Belen, and San Javier). The libraries serve as community centres that promote education, and the parks as transit nodes to foster communities. In addition, three cable car lines were built to connect the neighbourhoods and the city centre to improve mobility and economic opportunities of the impoverished. I had always been eager to visit these projects and to see how the neighbourhoods have really transformed. However, many Colombians were surprised by my choice of sights and warned against venturing into those areas. 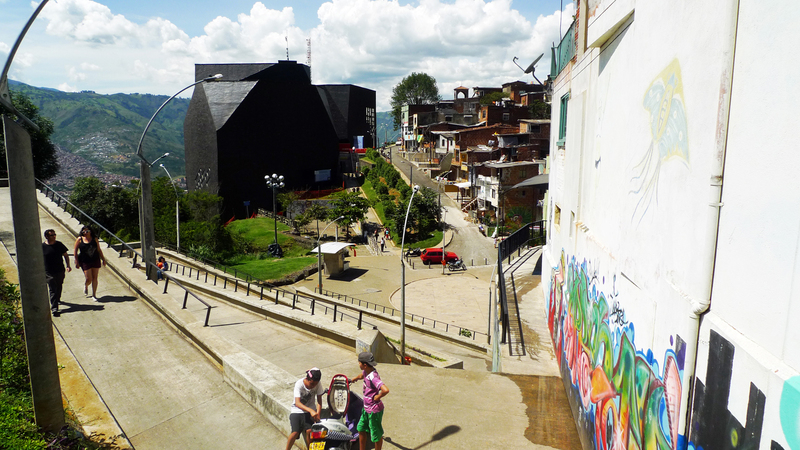 Despite having gone through award-winning transformation, it seems that some areas in Medellín are still perceived as dangerous to the locals. We first stopped by Parque de Los Pies Descalzos, the “Barefoot Park” in the business centre next to the EPM (Empresas Públicas de Medellín) headquarter building on a hot humid Saturday morning. EPM is the strongest financial force in the city and its foundation built the park in 1999 in order to give its employees and the city residents an attractive urban space. Maybe it was a Saturday and there were not many employees around, the park was much more empty than I’d expected. Only a few families were seen, playing barefoot in the water and reposing in the shade of the bamboo garden. Then, we took the cable car up to the award-winning visually peculiar Biblioteca España, the library park in Santo Domingo. The cable car station opens to a vibrant plaza, surrounded by shops and residents merrily chatting. Under the bright sun, the colourful houses and murals made for a welcoming atmosphere. There were teenage authorized tour guides around, ready to give tours of the project. Residents were coming in and out the laughter-filled library. The architectural details created many spacious rooms filled with light, which make the spaces desirable to linger. On the other hand, one could already see evidence of wears and tears in the building: paint was peeling off on many of the walls; facades and windows needed major cleaning. One might wonder whether the construction was done on a low budget, or whether a significant maintenance budget for these libraries was needed. Even though we felt safe in the library park, we were forewarned not to wander too far away. I wondered if I had walked further out, would I have felt as safe and welcoming on those streets? Looking down from the cable car, I saw winding streets organically dissected the extremely steep hillsides. Mini-buses crisscrossed. It appeared that the commute up and down this vast area would still be laborious for the residents who did not live near the cable car stops. Houses were clearly built incrementally with illegal utility lines sticking out haphazardly. One of the locals in the our cable car said the cable car had eased the commute; another said they were only using the cable car to go up Parque Arvi on the mountaintop and would not stop by Santo Domingo at all. When we drove past the lusciously green riverbanks along the highway, I was impressed by the cleanly maintained and well-built spaces. Though I also saw many homeless camping out. I could not help but ponder – would aesthetically pleasing spaces be enough if there were not enough social programs in place? I am certain the parks and libraries have provided valuable and safe spaces for communities to gather, and instilled the importance of education in residents. However, how vastly would the residents’ lives be improved in the long run if they were confined to those neighbourhoods with limited access to housing and economic opportunities? El Poblado, the wealthy and attractive neighbourhood of nightlife that we went to later posed a stark contrast to the areas we had visited during the day. 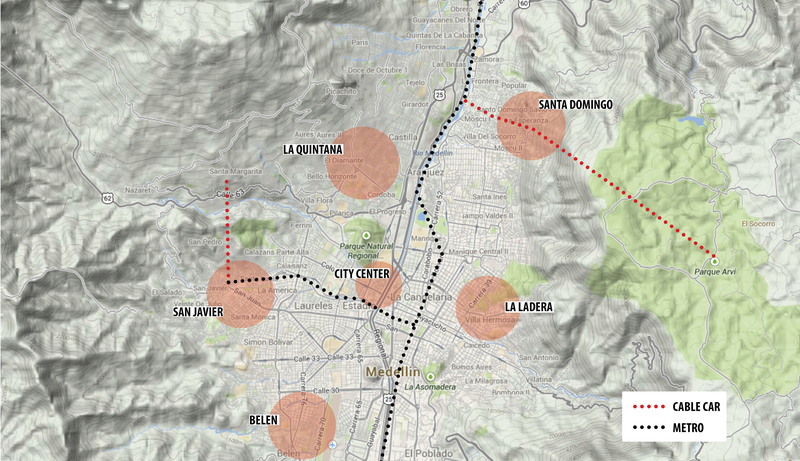 The new cable cars and metro have made traveling between these areas much easier, but the social and economic connections seem to still have a long way to go. My very short trip only gave me a glimpse of the country. I met many friendly people and had a taste of the country’s natural beauty and vibrant cities. I am impressed by the big infrastructure and design projects that aim to improve the country, though I doubt whether they serve more as ostentatious gestures than incisive tackles to social problems. I could not wait to visit the country again, and during the time in between, to really learn more about Colombia. Hi Jessica! I tweeted this post and hash tagged it to CNN and BBC! All the best. Jessica, I tweeted a link to this article and hash tagged it to CNN and BBC. Cheers!